Dates for several of the Club run open competitions including Beerfest 2019, Merri Mashers IPA Competition and Belgian Beerfest 2019 have been announced. Details available here. Results will hopefully be up on the website tommorrow night. Thanks to everyone who helped make this years event a sucess. Almost 600 entries judged at this years event. Important information for all VicBrew 2018 entrants, judges and stewards. 2. Closing date for entries will be 1st September, three weeks before VicBrew 2018, which is to be held 22-23 September 2018. Beerfest 2018 hosted by "The Melbourne Brewers". Competition to be held on 24 - 25 February 2018. Free lunch is included for all judges and stewards, and there will be a raffle with some great prizes. A special collaboration beer will be tapped on the day. Plenty of Mashers will be around to talk beer and brewing, and all home brewers are welcome to join us at The Terminus Hotel North Fitzroy. Judging will commence at 1pm sharp on Sunday the 25th of March 2018. Belgian Beerfest 2018 hosted by "The Yarra Valley Brewers". Competition to be held on Saturday 21st April 2018 at Hargreaves Hill Brewery in Lilydale. Partial results for AABC 2017 now available. There is less than four weeks left for entries to be lodged. The 16th of October is the cut off for all entry forms. As well as Gold, Silver and Bronze classification awards and solid medals for Gold & Silver all winemakers will have access to judges’ comments on their specific entries. Good Luck and may the best wines win! Official Results for Vicbrew 2017 are now available. Results and judging sheets should be available to entrants in compmaster later this evening. Thanks to the many judges, stewards and other volunteers who helped make the event a sucess. The 2017 Bayside Brewers Oktoberfest Homebrew Competition will be held on Saturday 7th October - from 11 am. NB - we will NOT be accepting entries on the day of the comp, so please drop off your entries to one of the usual locations the week before the comp. Transport can be arranged to/from Frankston station. Camping is available at the winery if you'd like to stay Saturday night. Many of the Bayside members camp. The club will be putting on a spit roast Saturday night, and breakfast on Sunday (for a small fee), or you're welcome to cater for yourself. Results for the Yarra Valley Brewers Belgian Beerfest 2017 are now online. NOTE: That some results announced at the event were incorrect! Yarra Valley Brewers apologise for the mistake. Thanks to everyone who judged and helped out on the day. Results and trophies will be posted early next week. Vicbrew will be held on September 16th and 17th at a venue to be determined. AABC 2017 will be held in Perth on October 14th and 15th. The list of categories and styleguides to by used at the National Competion (AABC 2017 in Perth) have finally been released. A number of substyles have been added and style descriptions updated using the 2015 BJCP revisions. Vicbrew 2017 will also use the updated AABC guides. The List of AABC cateories and the full AABC styleguides are available in pdf format. The Melboune Brewers "Beerfest 2017" competition is still seeking judges and stewards for this competition on February 23 and 24th. Competition details available on The Melbourne Brewers website. The Yarra Valley Brewers "Belgian Beerfest 2017" competition will be held at Hargreaves Hill Brewery on April 1st. Competition details now online. Bayside Brewers Oktoberfest will be held on November 5th this year after ANHC 2016. Details and entry forms are now on the Bayside Oktoberfest website. Official Vicbrew 2016 Results summary and Full Results are now online. Congratulations to all place getters at Vicbrew 2016 last weekend. The entry form for qualifying entries for AABC 2016 is now available. Entries for Vicbrew 2016 can now be registered online at compmaster.com.au Entries must be delivered to a Vicbrew 2016 collection point by Saturday August 20th. Thank you to all the people who helped the Yarra Valley Brewers run Belgian Beerfest 2016 on Saturday. For anyone interested in mead, fruit wine or still & sparkling cider the Eltham and District Wine Show has categories for each! As a previous entrant to the Eltham and District Wine Show we invite you to participate again. The 47th Annual Wine Show will be held on the Saturday and Sunday 12th & 13th Nov 2016 so get your wines ready. · Really practical and useful advice on winemaking from invited speakers and also from general conversation with members. · Opportunity to link in a group with other members to make country and grape wines. · Email forum for online discussions with members and monthly newsletter. Joining the Guild will also entitle you to attend the Annual International Dinner on the 21st May at the Veneto Club and the theme this year is French Cuisine - $50 per head for a great night of wine, food and entertainment. Full rules for Vicbrew 2016. Important information for all VicBrew 2016 entrants, judges and stewards. 1. Entries will be online only. 2. Closing date for entries will be 20 August, three weeks before VicBrew 2016, which is tentatively set for 10-11 September 2016. The running of VicBrew 2015 was a challenge. The hugely increased number of entries, combined with limited available manpower stretched the limits of the systems that have been used for previous competitions. This caused quite a few issues and a lot of problem solving on-the-fly during the Competition. Everybody involved deserves credit for pulling together and making it work despite those challenges. In order to address these issues and in anticipation of increasing entries in ensuing years, robust discussion has been had within the organising committee and some changes made to the way VicBrew will be run for 2016. These are designed to enable us to cope with 600+ entries and make the competition run more smoothly for all involved – entrants, judges, stewards, and the organising committee. All of these changes will be subject to review after VicBrew 2016. 1. Entries will be online only. There will be no provision or allowance for paper entries of any kind. Offline entries make up about 30% of all entries, but take 3-4 people several days to collect entries from all the drop-off points and collate the information associated with them. An online-only system will free up a considerable number of hours and reduce the number of registration errors. It will also provide us with full details about entry numbers in each category as soon as entries close, which will allow us to better plan the competition and finalise the judging roster much earlier. We are working on a re-vamped online system with better stability and functionality, which will be up and running for VicBrew 2016. We expect that entrants without computer access will be able to ask a friend to assist with entering. 2. Entries will close 3 weeks before the competition instead of 2 weeks to allow us to better deal with the expected increased number of entries, to improve planning, and to reduce stress for all involved. Height - including cap or cork 300mm. Minimum volume requirements remain unchanged. These values are determined by the dimensions of the crates we have available, as there will be no flexibility to deal with over-size bottles. Do not enter anything that's “Just a couple of mm over”, it will not fit and will be disqualified. Because of the large number of entries in many categories, it is no longer feasible for the same set of two to three judges to judge every beer in a category. For example, at VicBrew 2015 half of the 20 categories had more beers than could be judged in a single day. Thus we really needed 20 to 30 judges able to judge both days, but many judges were only available for one day. This led to a shortage of judges for some categories but other judges who we couldn’t use or who were under-utilised. 1. All large categories will be split into flights (group of about 12 beers) with each flight judged by a different judging panel. The scores from the panels will be compared directly against each other and used to determine the winning beers. There will be no scaling to account for potential differences between the judging panels. This is effectively the system we use to determine Champion Beer, which is selected as the highest scoring beer across all categories. In some competitions, additional judging of the best of the flights is done (often called a mini-BOS, e.g. www.bjcp.org/docs/MiniBOS.pdf), but this requires an additional bottle from all entrants and this is considered impractical at our current venue. We realise that this system is not perfect but consider that it is better than the system we’ve been using with some judges having to evaluate 30+ beers in the one day, sometimes very strong and very bitter, with consequent consistency issues. 2. Where necessary, VicBrew will adopt a queued judging system. This system is explained at www.bjcp.org/docs/Queued_Judging_judges.pdf. 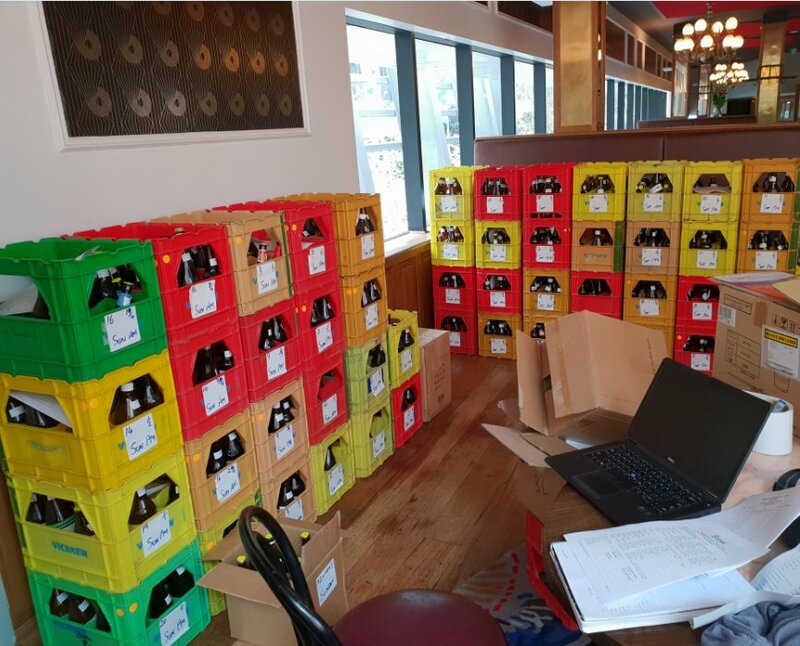 It still uses several sets of judging panels, but instead of having a pre-determined list of beers for each panel, as each panel finishes judging a beer, they are served the next beer off the master list for the whole category. This means that only one steward is required for the category and it simplifies the serving procedure. 3. Where necessary, some entries may be pre-judged before the main competition. This will allow us to make more efficient use of judge availability and space. The date for Vicbrew 2016 has been tentatively set for the 10th-11th September. Thank you to all the people who volunteered their time to help at Vicbrew over the last 2 days. We had a record number of entries; 602 vs 458 last year, so we needed every pair of hands we could get. We can only make this work with your help.